Announcement Semi Abstract Modern Contemporary Paintings - Original Oil & Acrylic Artwork. My gallery features an overflow of studies...I love to experiment with Oil & Acrylic mediums and applications to create semi-abstract, modern art; a style of painting in which the subject remains recognizable although the forms are highly stylized in a manner derived from abstract art. I am also and artisan ! Semi Abstract Modern Contemporary Paintings - Original Oil & Acrylic Artwork. My gallery features an overflow of studies...I love to experiment with Oil & Acrylic mediums and applications to create semi-abstract, modern art; a style of painting in which the subject remains recognizable although the forms are highly stylized in a manner derived from abstract art. 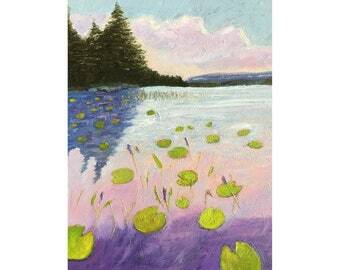 Lake Lily Pads - Original Oil Painting - Belgrade Lakes, Maine - 9x12"
So lovely! Great depiction of HIS care! Looking forward to this soon event! So beautiful and expressive! Thank you! I love this piece! This is so gorgeous! Thank you for shipping so carefully and quickly! I love it! Absolutely stunning. I am completely humbled to own it. I grew up on a small farm in rural Maine; a quiet and sensitive introvert that felt more at home hanging out in the woods or with my barnyard animal friends. Creating was second nature; i drew, painted and sculpted what i loved. It was my "voice," what i could not express in words. My hands either created or collected things from nature; rocks & shells or butterflies. Yet, by junior high, and throughout high school, my creativity had somehow become suppressed. i focused rather on my studies in science/biology & individual sports, like gymnastics. Influenced to be like my parents - to work in the medical field - I began my college studies prepared to do so also. However, 2 years into my studies, a sudden surge of creativity bubbled up from deep within, as suppressed emotional pain & issues of the heart began to surface - they required a voice. And so the need for creative expression began to overtake my life. At a "career crossroads," I had to make a choice - which direction to take ? so i went with my heart, changed majors, & finally graduated with a Bachelor of Arts in Studio Art (Dec, 1985). I have been self-taught ever since I graduated from college. Six months later my life suddenly changed after an encounter with God ! I spent years traveling (even found my husband in South Africa !) We traveled, raised & homeschooled 3 wonderful boys (the last one is nearly finished high school - i am so happy :). Wearing many "hats" & having many "irons in the fire", it has been a challenge to find the time to develop as an artist, but it has been an exciting journey too ! I love studying & discovering new ways of working with oil, acrylics & other mediums. Much of my artwork on Etsy is an overflow of these studies as i continue to hone a unique artistic fingerprint & voice. Along the way, I have also developed skills as an artisan, creating modern minimal jewelry designs in 14K Gold & Silver. I am so grateful to God for the ability, the gift to create beautiful things that bless others ! In April 1986, right after graduation, I got on a plane with passport, backpack, & Eurail-train pass in order to travel Europe - in search of Truth & the reason for my existence. Though self-hate & depression wanted to take me to the grave, I knew that if I could find the Way to God, some stairway/doorway to Him, that I would find unconditional Love & perfect Peace that i knew was beyond the natural realm. Well, on July 21, 1986, I had an encounter with God that changed my life in a radical & wonderful way - i have never been the same ! I encountered the Truth in Jesus Christ, the Son of God. I discovered that He had died on the cross for me ! That there was a huge chasm between me & God - it was called SIN. God's Son paid the ultimate price to bridge that GAP; to make The Way back to the Father ! That revelation that set me free; from guilt, shame & the heavy burden I carried from things I had done, as well as relationships that had torn me. The One Who had created me began to heal my broken heart & broken life as I yielded myself to Him, spending time with Him & in His Word. 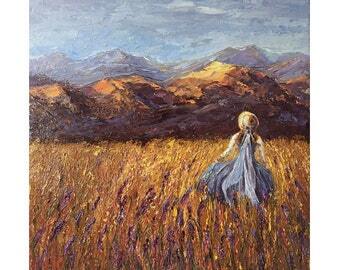 He also asked me to surrender my gifts & talents to Him, since being an “artist” was my sole identity. Over the years, my relationship with Him continues to grow & deepen as I put my faith & trust in Him; allowing Him to be the center of my life. My identity is now found in Him, not in the “gift” itself. How freeing to have a relationship with My Creator God & Father; to discover who I am as a child of God through believing on Him; to have a true eternal purpose in all that I do ! If you have any questions or comments I would love to hear from you ! Thank you for your interest in my art. Feel free to look around my shop. All of my artwork is original and unique, so it’s best to visit regularly. I see my shop as a gallery show (and often reflecting one of my current exhibits) of my most recent inspirations and latest works. If you have any questions, comments, or thoughts about my art you would like to share, feel free to contact me. It is my honor to share my work with you. Enjoy ! I accept PayPal, and money orders. Paintings will be shipped when funds clear, so the fastest way to receive your artwork is to pay with PayPal. For international buyers I can only accept PayPal payment, which is due at the time of purchase. Thanks so much! I carefully wrap your artwork to ensure your piece arrives in perfect condition. ♥ All orders are shipped in approx. 7-14 BUSINESS days unless otherwise notified; I ship USPS Priority Mail for most paintings, including insurance and tracking number and will send you a confirmation email with the tracking link. ♥ If you need your item sooner, please notify me and an expedited shipping option can be applied to your order. NOTE: I am not responsible for your order once it has been shipped, although please contact me and I will help to locate the issue if it has not arrived for some reason. ~Shipping is processed from the time your package is DROPPED OFF at the Post Office only. I will let you know by email with a "tracking number" the day that it has been shipped. PLEASE FEEL FREE to contact me with any questions, thank you ! ~I use USPS First Class for international orders. Some countries, however, require a forwarder, such as FedEx. Transit time is typically 7-28 business days. ~PLEASE NOTE: ~When your order has been shipped, you will receive an email stating that it has been shipped with a "Custom Form" number. The international postal service does not scan the Customs Form number during transit after it leaves the USA; i.e. your package will not be able to be tracked. ~Buyers are responsible for any and all duties and customs charges that may be incurred. ~ I am not responsible for your item once it has been shipped. ~NOTE: If you would prefer insurance & delivery confirmation, registered or express mail, please contact me for pricing before you order. I welcome commission inquiries. Please contact me for details and a quote.